The Centre is located in woodland in the Blue Mountains of N.S.W. 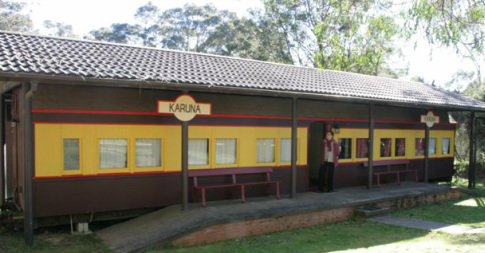 The Karuna Centre Katoomba is located in 374 acres of natural forest 1000 metres above sea level. The Fukushima children will benefit from the fresh air and from the safe radiation-free environment which will allow them to play outdoors. The surrounding area is a habitat for Kangaroo families and native birds such as wattle birds and kookaburras. 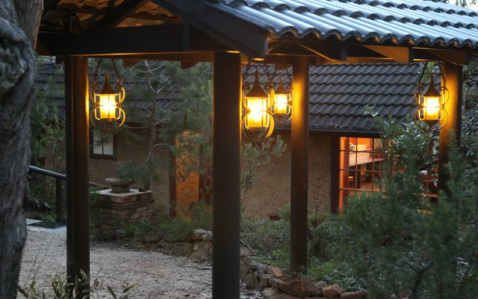 Within the grounds of the Karuna Centre, there are scenic bush walking tracks. The children can enjoy walks that lead to a beautiful waterfall and dramatic cliff-top views of the Megalong Valley. The Centre features a large main hall which can be used for many indoor fun activities such as table tennis. Near the hall is an outdoor playground that features basketball hoops, climbing frames and swings. Not far from the hall is a tree-studded two acre paddock that will provide plenty of space for ball games and tug-of-war. A Kangaroo family enjoying the afternoon sun in the grassy field. Three carriages converted to sleeping quarters provide a novelty accommodation experience.